Sasthapuri Tourist Home can be reached at M.M. Ali Road, Palayam at Kozhikode. It was established in 1977 by Sri. C. Karunakaran Nair, a Calicut based leading businessman in Hotel industry. Hotel can be reached from Calicut railway station about 0.5 km or from Karipur International airport about 22 km away. The local KSRTC bus stand is only 1 km from this hotel. The tourist home mainly caters to budget travelers who are looking for affordable rooms to stay at. For recreational activities Sasthapuri offers local sightseeing tours. Other facilities provided are currency exchange, doctor on call, parking facility and acceptance of credit cards. This tourist home also offers spacious conference hall for business meetings, corporate events, seminars and more. The well arranged marriage hall is equipped to organize your celebration parties. 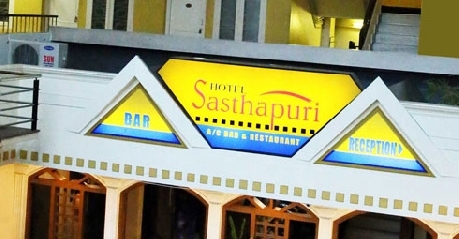 The 6 available non-A/c Rooms are the cheapest listed rooms at Sasthapuri Tourist Home. These single occupancy rooms are suitable for single travelers as well as leisure travelers on a quick holiday get away to Kozhikode. The fan air-cooled rooms have a single bed provided in the room. An extra bed/guest can be accommodated with you on chargeable basis. The simple décor room is given white color theme with dark colored bedding to add warmth to your stay. The limited spacious room has bedside seating arrangements and work desk. The room windows keep the adequate natural light. The attached bathroom has shower setup, 24 hours hot and cold running water facility and basic bathroom amenities. Your complimentary in-room facilities are – cable television, complimentary newspaper, in-room safe, internet access, direct dialing telephone connectivity, laundry service and 24 hr room service. The 6 available non-A/c Double Rooms are suitable for leisure travelers and business travelers who are looking to stay near Kozhikode beach in a cost effective hotel. These double occupancy rooms have the provision to include an extra member with you on chargeable basis. The fan air-cooled rooms have a double bed, bedside stool and chairs and space for work desk. The in-room amenities with your stay are – color television with satellite channels, internet access, newspaper, in-room safe, direct dial telephone connectivity, laundry service and 24 hr room service. The relaxing ambiance of the rooms is given bright yellow color theme and colorful décor. The room windows open to panoramic view of the city to sit and relax by its side. The furnished attached bathroom has shower setup, 24 hours hot and cold running water facility and basic bathroom amenities. The non-A/c Double Deluxe Rooms are aptly designed for leisure travelers, business travelers, families and small groups to stay at Kozhikode without hurting their pockets. The 4 available rooms are more spacious and elegantly designed with colorful bedding, stylish curtains and wall paintings. These are double occupancy rooms with a provision to include an extra member as per the charges. The fan air-cooled rooms have a double bed provided in the room with coffee table, sofa chairs and wooden cabinet for safekeeping. The attached balcony opens to this beautiful city near the beach while room windows maintains natural light inside. The deluxe amenities in the room are – cable television, direct dial telephone connectivity, complimentary newspaper, internet access, direct dialing telephone connectivity, laundry service and 24 hr room service. Round the clock hot and cold running water, shower setup and basic bathroom amenities are provided in the stylishly furnished attached bathroom. There are 2 A/c Single rooms offered by the hotel. These are budget rooms catering to leisure travelers, business travelers or single travelers. The room is available single occupancy with an on request provision to accommodate an extra member with you on some extra charges. The minimalistic décor rooms are a white canvass for colorful curtains and bedding. The adequately sized room has a single bed, work desk and window side seating arrangements. The room windows open to the beautiful sunset over Arabian Sea. The in-room amenities of these A/c rooms are – internet connectivity, color television with satellite channels, complimentary newspaper, laundry service, direct dialing telephone connectivity and round the clock room service. The modern furnished attached bathroom has walk-in shower, 24 hours hot and cold running water facility and basic bathroom toiletries. The A/c Executive rooms are luxury in budget rooms at this tourist home. The 4 available rooms are suitable for business travelers and groups looking to stay near Kozhikode beach. Spacious than single rooms these are single or double occupancy rooms with an option to choose a double bed room or twin bedded rooms. Hotel provides provision to include an extra member with you on chargeable basis. The fully A/c rooms are equipped with window side coffee table, sofa chairs and space for executive work desk. Executive rooms come with the luxury of – cable television, internet access, complimentary newspaper, in-room safe, laundry service, direct dial telephone connectivity and 24 hr room service. The relaxing ambiance of the rooms is given bright yellow color theme and colorful décor. The room windows open to the hustle and bustle of the city. The modern furnished attached bathroom has shower setup, 24 hours hot and cold running water facility and basic bathroom amenities. The single fully A/c Double Deluxe Room is more spacious and more elegantly designed for the comfort of families and small groups looking to stay in an affordable luxury home. This is a double occupancy room with a provision to include an extra member as per the charges. The fully A/c room has a double bed, coffee table, wooden cabinet and sofa chairs. A small living space is maintained with sofa seating and in-room dining arrangements. The room windows maintains natural light inside. The beautiful wall paintings, colorful bedding and stylish curtains add warmth to your stay. The attached balcony is to sit and relax while witnessing the setting sun over Arabian Sea. The deluxe amenities in the room are – direct dial telephone connectivity, cable television, complimentary newspaper, internet access, laundry service and 24 hr room service. The attached bathroom has shower setup, 24 hours hot and cold running water facility and essential bathroom toiletries. The only fully A/c suite at Sasthapuri is the luxury home away from home without hurting your pockets. The suite is aptly designed for the stay of families and small groups on a holiday to Kozhikode. This is a double occupancy suite with a provision to include an extra member as per the charges. The spacious room has a King Sized bed, coffee table, wooden cabinet and sofa chairs. The adjoining living room is equipped with sofa seating and in-room dining arrangements. The room windows keep the suite warm and charming with the constant flow of natural light inside. The beautiful wall paintings, colorful bedding and stylish curtains are welcoming. The attached balcony with dedicated seating is to sit and relax among the tropical greenery lining the sea shore. The luxury amenities in the room are – internet access, cable television, direct dial telephone connectivity, complimentary newspaper, laundry service and 24 hr room service. The comforts of the attached bathroom can be experienced with shower setup, 24 hours hot and cold running water facility and essential bathroom toiletries. The hotel offers Single, Double, Standard and Deluxe rooms to stay. The rooms are cozy enough for a comfortable stay. All the rooms are attached with a private bath and a sit-out. The well furnished rooms are spacious and airy enough to give you a fresh atmosphere. Always. The multi-cuisine restaurant at Sasthapuri Tourist Home serves Indian, Chinese and Continental delicacies. This fully air conditioned restaurant is open for breakfast, lunch and dinner. Being a budget restaurant and because of its proximity to railway station and bus stand it is popular among frequent travelers for a quick meal. The Roof Garden restaurant at the tourist home is open air setup located at the terrace top. It opens for breakfast, lunch and dinner. The restaurant is known for its special sea food dishes and North Indian cuisine when looking for a light meal. You will be surrounded with green plantation at the roof and coconut trees waving around you. Enjoy the lip-smacking food with panoramic view of the city and setting sun over Arabian Sea. The A/c Bar and Lounge maintained by the tourist home is the best place to hang out with friends and families and to make new companions here. This is an interesting setting with beach style décor and wooden furnishing. Soak into the ambiance and sip into the finest collection of domestic and international wines, beers, alcohols and spirits. Their finest offering of wide varieties of cocktails and mocktails will spin your senses.